A baguette is a specific shape of bread, commonly made from basic lean dough, a simple guideline set down by French law, distinguishable by its length, very crisp crust, and slits cut into it to enable proper expansion of gases and thus formation of the crumb, the inner soft part of bread. The standard diameter of a baguette is approximately 5 or 6 cm, but the bread itself can be up to a meter in length, though usually about 60 cm. A Parisian baguette typically weighs 250 grams (8.8 oz), but this is not legally regulated and varies by region. It is also known in English as a French stick or a French bread. 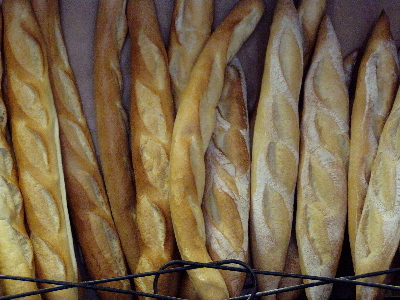 The baguette today is often considered one of the symbols of French culture. The "baguette de tradition française" is made from wheat flour, water, yeast, and common salt. It does not contain additives, but it may contain broad bean flour (max 2%), soya flour (max 0.5%), wheat malt flour (max 0.3%). Baguettes, either relatively short single-serving size or cut from a longer loaf, are very often used for sandwiches (usually of the submarine sandwich type, but also panini). Baguettes are often sliced and served with pâté or cheeses. As part of the traditional continental breakfast in France, slices of baguette are spread with jam and dunked in bowls of coffee or hot chocolate. In the United States, French Bread loaves are sometimes split in half to make French bread pizza.